Last month not-for-profit health body ukactive held a one-day workshop in London, aimed at educating and empowering Britain’s boutique fitness sector. Sweat, which returned for the third year running, brought together more than 200 innovators, investors and leaders from the fitness industry to discuss future strategies in the face of unprecedented market change. Exploring a range of topics, including how to create and cultivate experiences, understanding disruptors, the complexities of Gen Z and whether the industry has hit peak boutique, through engaging keynotes and thought-provoking panel debates, the event provided an opportunity for business owners to better understand the boutique fitness model and discover new ways to stay ahead of the market. 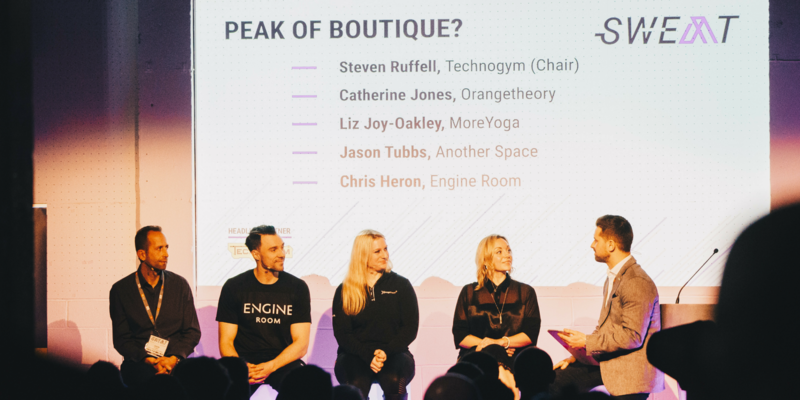 “It was fantastic to see a packed venue full of studio owners, marketing experts, leading suppliers and other fitness visionaries all in one room at Sweat to discuss the future of the boutique sector,” commented ukactive CEO Steven Ward. “The big takeaway from the day for me was that we haven’t reached ‘peak boutique’ just yet. This diverse sector continues to go from strength to strength and the opportunities are there for world-class boutiques to scale rapidly if they can embrace emerging technology, data and partnerships without sacrificing their core identity,” he added. Stay true to your brand. Those words were repeated across several panel sessions at Sweat, with Gen Z specialist Chloe Combi noting that younger generations are more insistent than anyone on brands being both transparent and authentic – fakery is the ultimate sin. Rory McEntee, Marketing Director at Gymbox agreed, arguing that younger generations can see through traditional marketing and are looking for genuine connections – meaning brand identity is vital. Brand and marketing expert Charlotte Dennis also talked about the need to build a bond with customers, whilst staying true to the story of your brand, drawing on her experiences at Nike. The importance of understanding and catering to your customer was a common theme across all panel sessions. David Lloyd’s Head of Fitness Product and Programming, Michelle Dand argued that boutique studios will fail if they don’t know what audience they’re looking to attract, adding that the most successful boutiques continually evolve based on customer feedback, forever refining their offering. Matthew Januszek from Escape Fitness shared this sentiment, stating that one of the biggest risks for boutique studios is ‘standing still’ while others improve. Boutique fitness titan Emma Barry also highlighted the power of early-stage tech transformation, with data able to transform business models, allowing boutique studios to respond to constantly changing customer preferences in real time. Data-driven models will also allow pioneering studios to meet consumer trends as they begin, offering them a head-start on the competition, she argued. You’re only as good as your last class, explained Jason Tubbs, Managing Director at Another Space. Boutiques are built through their instructors, so brands have to invest in them, he added. It can be harder for younger studios to secure top talent admitted David Lloyd’s Head of Fitness Product and Programming, Michelle Dand. But for operators that don’t possess the budget to hire superstar trainers, the key is to nurture raw talent and grow together, she revealed. Panellists agreed that in order to cultivate a sustainable market, the boutique industry must get better at training instructors. Collectively operators need to understand their worth and work to elevate standards, it was argued. Barry also identified boutique fitness as a major opportunity for new technologies, with fit-tech less integrated into the sector than in comparable industries such as beauty and medicine. Technology will completely change the face of fitness, so long as it is directed to making things easier and more of an experience for the consumer, Mark Hutchison of Hutchison Technology said. The rise of digital content poses a challenge for all of the fitness sector, but particularly for boutique studios –– those who adopt and adapt will thrive, while those who don’t will fail. When experts were quizzed on whether the sector had reached ‘peak boutique’, the answers revealed new directions of growth. Jason Tubbs, Managing Director at Another Space argued that ‘peak boutique’ was a long way off, but warned that investors looking for a ‘quick buck’ would be in for a surprise, due to the tough nature of the market. He said that those without the necessary expertise and understanding posed a reputational risk to the boutique sector. MoreYoga’s Head of Vibes Liz Joy-Oakley encouraged boutique brands to explore cross-sector partnerships to fuel growth, such as the collaboration between her business and Everyone Active. She said it’s important for boutiques to recognise where they are missing something and to look for a partner to help. She cited MoreYoga linking up with Broga to attract more men, as an example. And Catherine Jones, Head of Marketing at Orangetheory Fitness set out the huge growth opportunities outside of London for successful boutique brands, pointing to examples and opportunities away from traditional settings in major cities. Want more insights into the future of the boutique fitness industry, check out our recently released 2019 Business Of Wellness Trends Report.